Tweak to no end on the Novation MiniNova. With 256 preset sounds on board, sweet synth effects, a vocoder, and a host of tactile controls, this compact 37-key synthesizer is bound to be your go-to sound and FX station on stage and in the studio. And not only is the MiniNova powerful and easy to carry, it's also one of the most affordable virtual-analog synthesizers around! 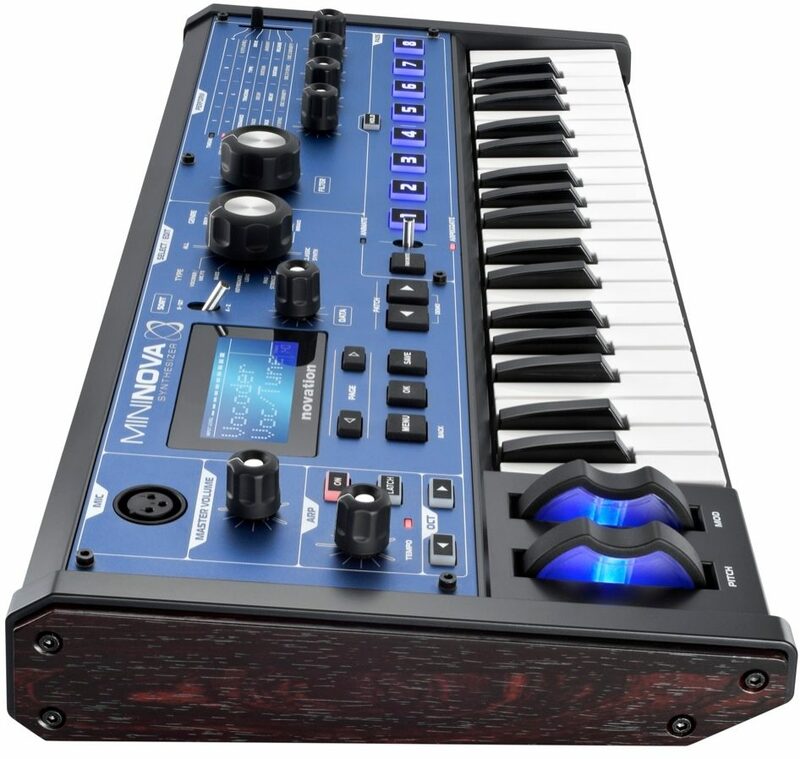 Like the UltraNova, the MiniNova's older sibling in Novation's Supernova series of synths, the MiniNova boasts a powerful analog-modeling engine plus super synth effects designed to push soaring leads, phat bass, lush pads, and old-school synth sounds to the forefront of your tunes. Think of the MiniNova as the same synth powerhouse as the UltraNova, but significantly smaller in scale and with 37 mini-keys. When connected to a laptop via USB or to another keyboard or sound module, this little synth serves double duty as a MIDI controller. The MiniNova gives you 14 conventional waveforms (square, sine, sawtooth, pulse, triangle, and combinations), 36 wavetables, and 20 digital waveforms to choose from. On each of the three oscillators (per voice), you have density/detune for fattening up sounds, virtual sync, and a signature "hardness" lowpass filter of sorts. Shape your sound even further with 14 filter types, 6 envelope generators, 3 LFOs, and 20 modulation slots for stringing synth engine modules together. Add up to five effects to each sound, for a truly custom, multi-dimensional feel. The MiniNova's built-in vocoder allows you to become your favorite Beastie Boy, while VocalTune lets you manipulate your vocals even more. Speak into the microphone, and on the mini keys, tap out the line that you want your voice to follow. VocalTune will do the rest, aligning your voice with that of the melody you just played, making sure you're in tune in the most (un)naturally pleasing way. You can also send your vocals through the MiniNova's effects -- reverb, distortion, chorus/phase, Novation's gator compression, or EQ -- and using the instrument input, do the same for a guitar, bass, or other instrument. Perform right out of the box with 18 massive voices and 256 presets, then jam away and save another 128 of your own. Free Patch Librarian software enables you to store as many sounds as you want on your computer, and access to downloadable sound packs lets you expand your collection for free. Still not the sounds you really want? Edit them with the included MiniNova Editor software, which works as a plug-in within your DAW or music software. The MiniNova also comes with Ableton Live Lite, Novation Bass Station, and a 1 GB Loopmasters sample pack. Your hands will find their place on 37 velocity-sensitive mini-keys, backlit buttons, LED-lit pitch wheel and mod wheel, smooth pots, and control encoders. In Animate mode, you can trigger unique performance functions by hitting one of the eight backlit buttons while playing the keyboard. And when in Arpeggiator mode, you can perform with as many as 33 arpeggiator rhythms in real time, using the MiniNova's array of eight buttons as an arpeggiator step sequencer. Download MoroderNova Patches for Free! MiniNova customers can now access 30 Giorgio Moroder inspired synth patches upon registration. These patches, initially exclusive to Novation's limited edition MoroderNova, are downloadable absolutely for free. zZounds is an authorized dealer of Novation products. - Square, sine, tri, sawtooth, pulse, 9x saw:pulse combinations. Don't let its size fool you. 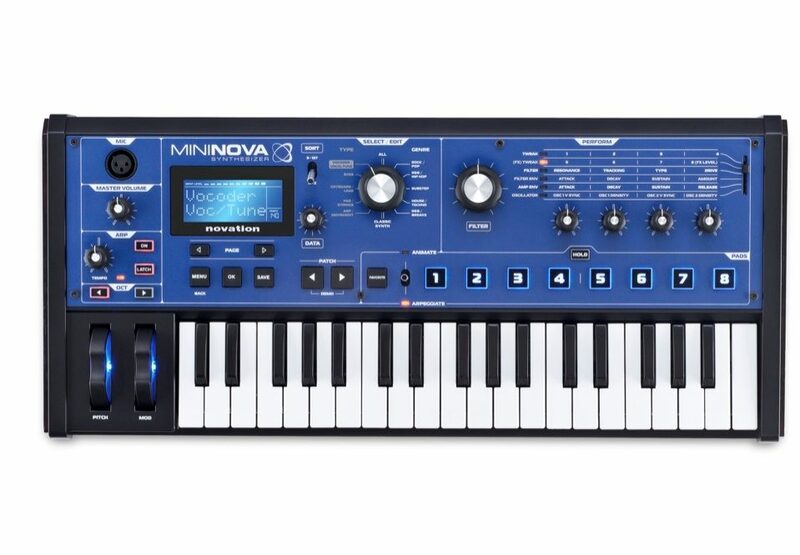 MiniNova is the most recent in the 'nova' range of synths dating back to the legendary Supernova series. It has the same incredibly powerful sound engine and synth effects as the Novation UltraNova which means it is capable of creating dirty-fat bass synth sounds, soaring leads, lush pads and vintage synth sounds. All this in a 37 mini-key form with a USB port and MIDI i/o so you can hook it up to your laptop and control your music software or connect it to another keyboard or sound module. MiniNova takes vocal effects one step further. As well as a vocoder, it has VocalTune. This means you can talk into the mic and play the tune you want your voice to follow on the keyboard recreating those classic hip hop / urban vocal effects. You can also run your voice through MiniNova's effects engine, adding reverb, distortion, chorus/phase, gator compression or EQ. This doesn't need to be limited to your voice; there is an input into which you can plug a guitar or any other instrument and give it the same treatment; effects or vocoder. MiniNova has 256 onboard sounds and space to save another 128 of your own sounds. You can quickly search for sounds by selecting the style of music you're making, or the type of sound you're after whether it's bass synth, lead - hip hop or techno. MiniNova comes with a free software Patch Librarian so you can store as many sounds as you want on your computer. If 256 is not enough, there are numerous soundpacks for MiniNova assembled by renowned artists and sound designers. These include plenty of vintage synth sounds. Switch to 'Arpeggiator' mode to jam with arpeggiator rhythms in realtime. The 8 buttons act like an arpeggiator step sequencer so you can switch steps in and out! Editing sounds in such a powerful synth can be overwhelming, so they've created a software application that gives you visual access to the synth engine. The MiniNova Editor works as a plug-in within your DAW or music software. You can fully edit MiniNova using the hardware; the software just makes it easier to see what you are doing. MiniNova has an enormously powerful sound engine and synth effects, unheard of in a micro synth. There are 14 conventional waveforms to choose from (square, sine, sawtooth, pulse, triangle and combinations), 36 wavetables and 20 digital waveforms. Each of the three oscillators (per voice) have density/detune for fattening up sounds, virtual sync and 'hardness' - which acts as an additional lowpass filter. There are 14 filter types (and you can run two simultaneously), six envelope generators, three LFOs and 20 modulation slots where you can link modules of the synth engine together to shape sound. MiniNova can add up to five effects to each sound including distortion, reverb, chorus/phase, delay, compressor, EQ and Novation's unique gator effect. The 'Perform' section enables you to access the synth and effects engines by switching between six positions to assign four knobs, giving you instant access to 24 sound-bending parameters. 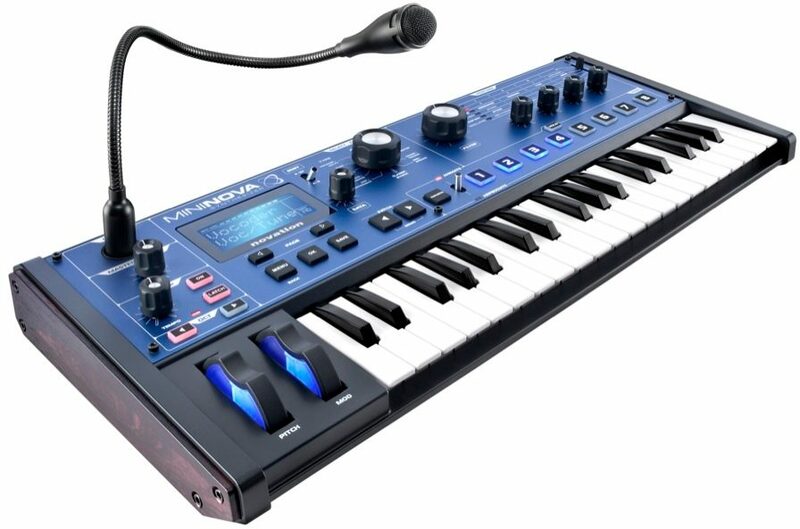 MiniNova has Novation's signature Nova-series synth-engine onboard, capable of creating and editing massive sounds with up to 18 voices and powerful effects. The VocalTune function can recreate iconic urban and hip hop vocal sounds, as well as classic house and techno voice effects with the onboard vocoder. Instantly find the sound you need by type or musical genre, from bass to pad, hip hop to house. Save and store another 128 of your own sounds too. MiniNova can add up to five effects to each voice including distortion, reverb, chorus/phase, delay, compressor, EQ and Novation's own gator 'stutter' effect. A free software editor allows full editing of the synth and effects, the Patch Librarian enables storage of as many of your own sounds - or the free soundpacks - as you want. Run guitars and other instruments though the vocoder, VocalTune and effects. There is a line input into which you can plug a guitar, bass or any other instrument which can then be routed through the effects engine or the vocal effects. MiniNova is also a great compact desktop keyboard for triggering software instruments. It has physical MIDI i/o ports for triggering other external sound modules - or connecting to a larger keyboard. MiniNova customers can now access 30 Giorgio Moroder inspired synth patches upon registration. 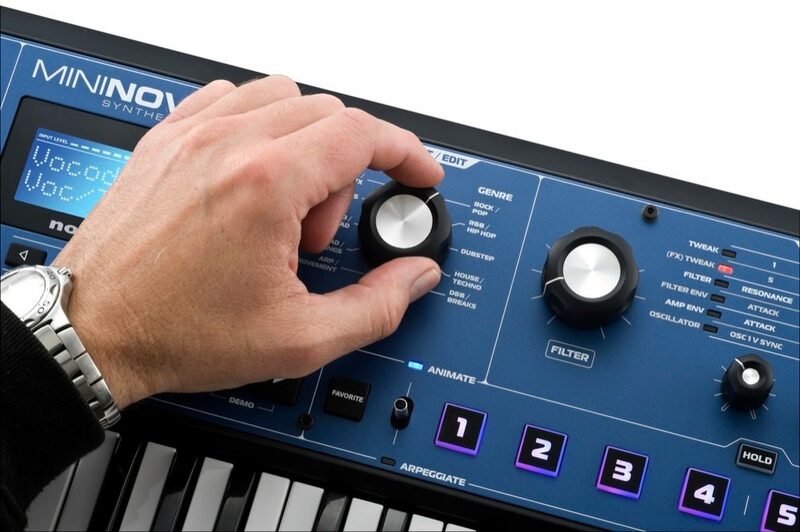 These patches, initially exclusive to Novation's limited-edition MoroderNova, are downloadable absolutely for free. This review has been selected by our experts as particularly helpful. "Powerful synthesizer which greatly exceeded my expectations." Sound: It's digital and that's apparent in some of the presets. The raw waveforms sound cleaner than those on an analog synthesizer. It's capable of producing very warm sounds with the right programming. I was able to program identical patches on this and my Moog Sub 37, played them side by side and had trouble telling the difference. You can create which cover the full spectrum of what's possible with a "modular" synthesizer. It behaves like a modular system because of it's extensive modulation matrix. Feature: First and foremost is the voice architecture. They thought of everything and even a few things I wouldn't have thought of. The control panel is simple and very well thought out. You get plenty of real time control with the filter and performance knobs. the octave and animate buttons add more live performance capabilities. I use the animate pads a lot more than I thought I would. The LCD screen is large and easy to read. One tip I want to pass along addresses the fact that it doesn't run on batteries. It's not true! you have the option of USB power. Simply get a portable USB power supply with a minimum 1A output, plug it in and you're good to go. If you don't want the power supply sitting loose, put a piece of Velcro on it, a piece on the MiniNova, attach. Voila, instant battery compartment! My one nit pick on features is that the instrument isn't multitimbral. It can only do one sound at a time. That sound can be very complex and can change from one end of the keyboard to the other, but you can't do layers and splits. When working with a sequencer, you are limited to one channel and one sound. This is the only major feature I felt should have been present and wasn't. One other thing worth mentioning is that it doesn't put audio out over USB. It send and receives MIDI data only. Not a big deal for me. I have it plugged in to a USB mixer in my studio. Ease of Use: Programming is very easy if you have a fundamental understanding of synthesis. If you don't, there's a good tutorial in the instruction manual. To program from the panel, repeated presses of the menu button moves you through the menu hierarchy. The left/right buttons take you through the individual parameters. Once you get used to this somewhat fiddly process, navigation is pretty easy. You go to the parameter you want, use the data knob to dial in values and you can listen to the changes in real time. A software editor is included which shows you a lot of parameters all at one and allows you to jump quickly between them. I use both the editor and the control panel when I'm creating a program. The editor has to opened as a plug in within a DAW program. This another nit pick I have. It would be nice to have a stand alone version of it. The DAW setup is a bit clunky and I had trouble setting it up, but I finally got it working. If you don't have DAW software on your computer, fear not. The MiniNova comes with Ableton Live Light, which is a free download when you register the instrument. You can use this DAW for your editor. Be sure to get all of the downloads. You'll need the system folder, editor/librarian and Ableton downloads for this. You will need to configure the MiniNova as a plug in within Ableton. Instructions for this are on the Novation website. The MiniNova comes with 256 presets and 128 blank memory locations. New programs can be written to any memory location including the presets as long as memory protect is turned off in the global menu. Quality: It appears to be very well made. Even though the size and appearance make it look like a toy, the construction is solid and the controls are sturdy. The select switch for the performance matrix feels a bit flimsy, but not enough to concern me. I think this instrument will hold up well on the road as ling as it's protected and handled properly. I have mixed feelings about the mini keyboard. It keeps the footprint of the instrument small and is quite playable unless you are doing complex arpeggio and chord combinations. I tend to play it a lot via MIDI from a larger keyboard. Value: As far as the value goes let me put it like this. If you were to take the voice architecture of this instrument and implement it as an analog synthesizer with separate controls for each function, you have an instrument with would cost well into five figures. I know there are other competing mini synths near this price point, but I can't get over how perfectly thought out this is and the fantastic sound quality it has. Manufacturer Support: This is my first experience with Novation so I haven't had to contact customer service. The registration and free download process went without a hitch. The Wow Factor: This instrument is extremely appealing. I could make good music without it, but working with a synthesizer which has what I consider near perfect voice architecture is a real joy. It makes me regret not buying a Super Nova when they were available back in the day. Overall: I bought this primarily for the flexible vocoding and vocal tune capabilities. What I didn't expect was a very powerful synthesizer. One I started working through the parameters, I realized I have one very serious instrument on my hands. If I could design a synth myself from scratch, this would be it. This review has been selected by our experts as particularly helpful. 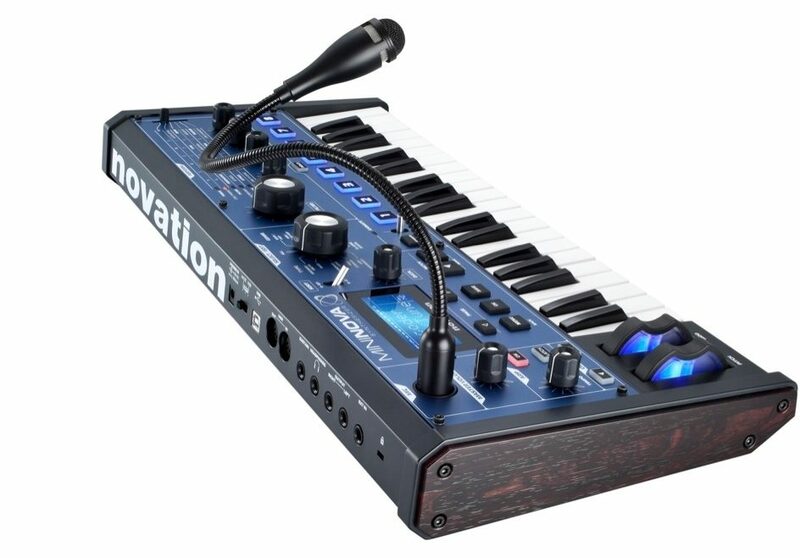 "Novation MiniNova"
Sound: This synth sounds quite good for having just 3 oscillators. I also think that the built in DSP has something to do with it. Ease of Use: I found it quite is to start modifying patches or even making them from scratch. I do find the keys a little bit too stiff, but that's probably because you have less leverage with mini-keys. Quality: The keyboard feels pretty solid. Although I did manage to break one of my keys (possible due to the fact that I bought it as a returned product), but I was able to superglue the key back on and I have had no other issues beyond that. I would give this keyboard more than 3 stars in the quality department, but because of the one key that broke, I kind of have to mark it down. Value: This product seems to be a great value for an entry level synth. Manufacturer Support: Haven't had to deal with them yet. The Wow Factor: I find this keyboard to be very good looking, and all of the lights just help it's cause. Overall: The MiniNova fits my musical desires very well. I play a lot of classic rock and prog rock, so most of the time I'm just playing a Hammond, Rhodes, or piano sound. Sometimes however I need a synth sound for a lead, or an occasional pad/string sound; this synth delivers! The only thing that I really don't like is the mini-keys, but I suppose if you want full size keys you could just buy the UltraNova, or use a full size midi keyboard to control the synth. Style of Music: Rock, Prog Rock, Prog Metal, Christian.